"She is a class act" who "sees the issues immediately and commands respect in any courtroom. No one messes around in her presence." Rosina is a highly respected Silk whose reputation for excellence has led to her instruction in high profile cases. 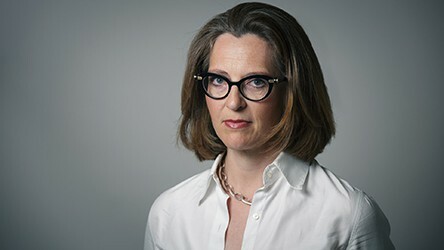 Her practice involves heavy-weight prosecution and defence of multi-handed cases of serious sexual offences, murder and fraud many of which are in the public eye. An ‘excellent’ practitioner and vastly experienced prosecution and defence counsel who is “meticulous” in her handling of the full spectrum of violent and sexual offences cases. Well known for her work in cases involving vulnerable defendants or witnesses, she applies skill and care when representing and cross-examining those with a learning impairment, those on the autistic spectrum, and those diagnosed with mental health problems. Rosina also demonstrates expertise in respect of the cross-examination and instruction of experts in pathology, psychology and psychiatry. 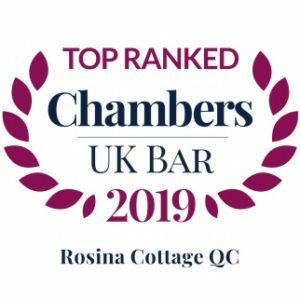 Rosina is a true expert within her field with extensive knowledge of law and practice and a calm and measured approach when presenting arguments. She received, nothing but praise in her dealing with the high profile Max Clifford case and soon after featured as The Times Lawyer of the Week. Her work in the case of Aravindan Balakrishnan was skilful and professional. Called upon by the media to comment or provide expert advice on matters of serious sexual offences, murder and fraud, Rosina also teaches and lectures on advocacy in respect of vulnerable witnesses and is a Lead Facilitator trainer for legal professionals in cross-examination of vulnerable witnesses. “Crime Silk of the year” 2017, Rosina has excellent communication skills and a pragmatic, professional and thorough approach. Rosina has a strong profile in prosecution and defence. She pays a close attention to detail, provides clear presentation of all the essential issues of a case and combines her strong tactical approach with her detailed understanding of the law. She has a quality practice in cases which demand strong advocacy skills with an ability to deal with complex forensic evidence and a deserved reputation for her skill in dealing with both defendants and witnesses of the utmost vulnerability. Operation Ravine (2017-2018) Prosecuting Jonathan King for serious sexual offences upon boys in the 1970s and 1980s. Operation Winthorpe (2016 and 2017) Prosecuted teachers from St Pauls School in serious sexual allegations upon boys in the 1970s and 1980s. R v Reza and Others (2014 and 2015) Prosecuted two trials involving an Access to Work DWP fraud against 14 defendants including an accountant and a doctor. 12 of the defendants were deaf. Vulnerable People and the Criminal Justice System (A Guide to Law and Practice) OUP (2017): Contributor.